If you have learned anything about me through my blog is that i am completely honest. So here’s another dose of honesty. I am a citizen of Flake City meaning I suffer with dandruff more often that I’d like to admit. It is most common during the summer when my scalp can’t catch a break with this hot weather and my not so cool showers. So how do I get rid of it? There are a few steps I take to get rid of it as fast as possible. This takes a few days, but I find this to be the best way to help my dandruff and scalp. I use a dandruff control shampoo. I used to use Head & Shoulders, but for some reason it did nothing for me. I searched & searched and was finally able to find something that helped. 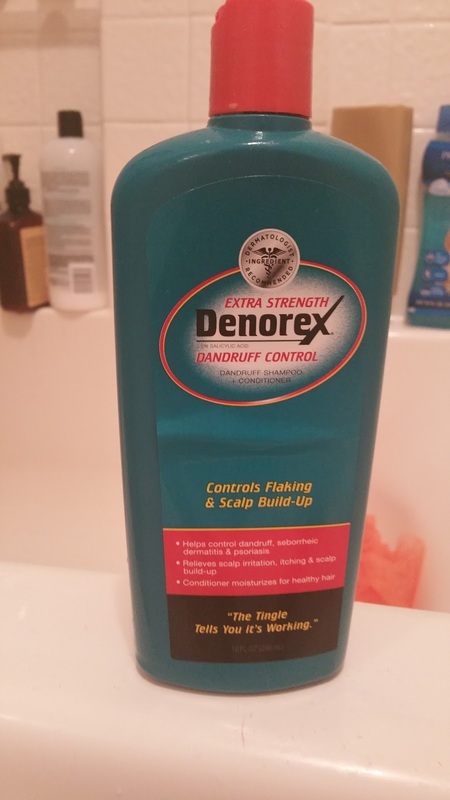 Denorex is an extra strength dandruff shampoo that really works for me! Believe me, it is not the most pretty looking or flower smellin’ but it does the job! It will sort of look like motor oil and smell like peppermint but the tingly feeling & clean scalp is well worth it. I will use this just like any other shampoo but will keep it in for 2-5 minutes, just to let my scalp absorb all the benefits. Once you feel the tingling sensation you know it’s working! Rinse it out & go on to step two! Now we will go back to our normal procedures. CONDITIONER. Okay you can use a conditioner, hair mask, or deep conditioner. I will normally use a deep conditioner, with this I apply all over. My scalp and ends will be covered in this stuff, the reason for this is because with dandruff your scalp is obviously lacking moisture and the best way I can deal with that is by using conditioner. I will leave it in for 5-10 minutes and then rinse it out. I know this was not a lot of information, but I hope it helps you all who do suffer with this. I know it can be embarrassing, but we all have to find a way to live with it and this is one of mine!